Welcome to the first day (Day #1) of Chocolate and Spices Theme Week. 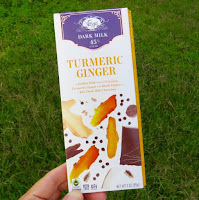 Today's beautifully packaged Turmeric Ginger bar from Vosges (Chicago, IL) was a unique blend of Asian/Indian flavors: turmeric, ginger, coconut, sweet curry powder and black pepper in 45% dark milk chocolate. Bold spice blends dominate yet complement and enhance mild foods like chicken, vegetables and/or rice. 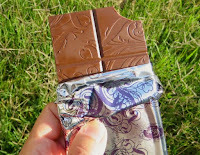 However, getting all today's spices to harmonize with a bold acidic flavor like chocolate in this (or other chocolate) bar may have been too much to ask. 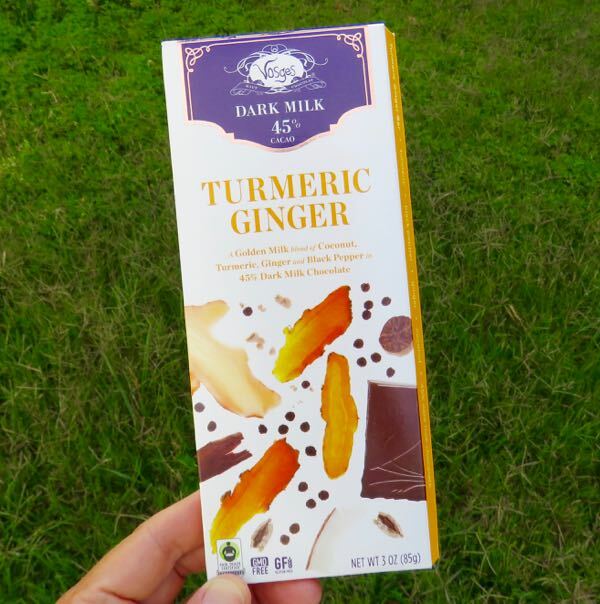 The complex flavor blend would be fine in a "golden milk" coconut milk-based turmeric and spice beverage without chocolate, but maybe not with cacao. The result was interesting, but some flavors seemed to be fighting each other a bit. This Vosges bar was labeled as free of gluten and GMO ingredients.